As low as $1,310 Delivered! Standard units come in 8, 12, and 16 compartments. Experience matters - - - see our Pad Installation Kit! The Pedestal Mount 4C Mailbox is perfect for nearly any size application! Request a free quote for your project now! The Letter Locker has set the standard for the industry. US Mailboxes offers top quality commercial and residential security mailboxes for the best protection against vandalism, mail theft, and identity theft. Our locking mailboxes will protect your valuable information! Our company seeks to have the best products at addressing these features. We are happy to consult with you to get the right security mailbox or cluster mailboxes for your specific goals. We are a US Postal Service approved group CBU mailboxes provider. We have worked closely with the USPS since 1983 and have a relationship and experience that has given us the respect of postmasters across the country. If you can't find cluster mailboxes or single security mailboxes that you need on our website, then let us know. We can provide most postal products. We have installed thousands of CBUs, including the fabrication of concrete pads per USPS specifications; we also provide mailbox installation consultations for your unique mailbox needs. We offer installation quotes in select areas of Oregon and California and for very large locking mailbox projects nationwide. 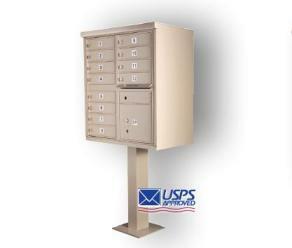 We give additional discounts on USPS approved large security mailbox purchases. Contact us online, or call (541) 678-1508 for more details. US Mailboxes is committed to continuing the values of maintaining a high quality service in a prompt and timely manner.